"The stories we love best do live in us forever. So whether you come back by page or by the big screen, Hogwarts will always be there to welcome you home." Harry Potter began as a series of seven fantasy novels by J. K. Rowling and later expanded into a multimedia franchise. 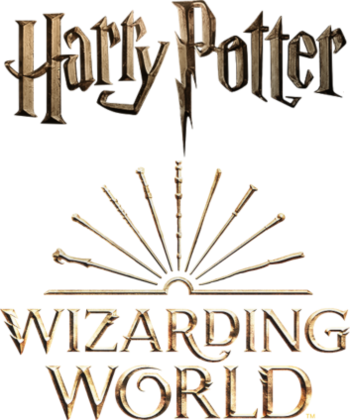 Following the release of Fantastic Beasts and Where to Find Them, the franchise as a whole has been rebranded as "Wizarding World". We have separate pages for its book, film, and video game incarnations; this one is a disambiguation page to help you locate the more specific one you were looking for. You can vote for your favorite installment here and you can vent all complaints here . Harry Potter and the Cursed Child (2016), an eighth Harry-focused installment in the form of a theater play, which debuted at West End. Harry Potter, a series of video games, most based on straight adaptions of the films, although including some original titles. LEGO Harry Potter, a duology of LEGO Adaptation Games. Book of Spells (2012) and Book of Potions (2013), Augmented Reality games that use the PlayStation 3's Wonderbook peripheral. Harry Potter: Hogwarts Mystery (2018), a mobile Role-Playing Game set in 1984note Charlie, born in December 1972, is sorted in 1984 along with Tonks. Both appear at the Player's sorting. Also, Bill Weasley, born in December 1970, mentions in the 1984 - 1985 school year that he wants to be a Prefect next year, meaning he's a fourth year student. -1991. Pottermore, an Expanded Universe website which is part online manual, part web game. Pottermore Presents, a line of eBooks which is a combination of existing Pottermore material and new information. Harry Potter Trading Card Game, a Collectible Card Game. Harry Potter: Hogwarts Battle, a cooperative Deckbuilding Game.